Spring is coming, I promise!. The weather is still playing games with us, and the fishing seems to be effected for a day or so after each frontal system. In between systems the fishing gets good and people catch all species for a couple of days. Then the cycle begins again. 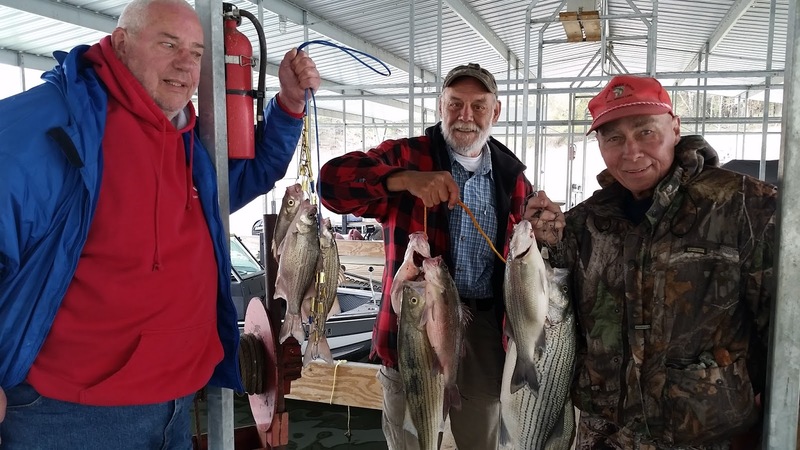 Over the last week many fish were caught including striped bass, hybrid bass, white bass, walleye, crappie, spotted bass and largemouth bass. 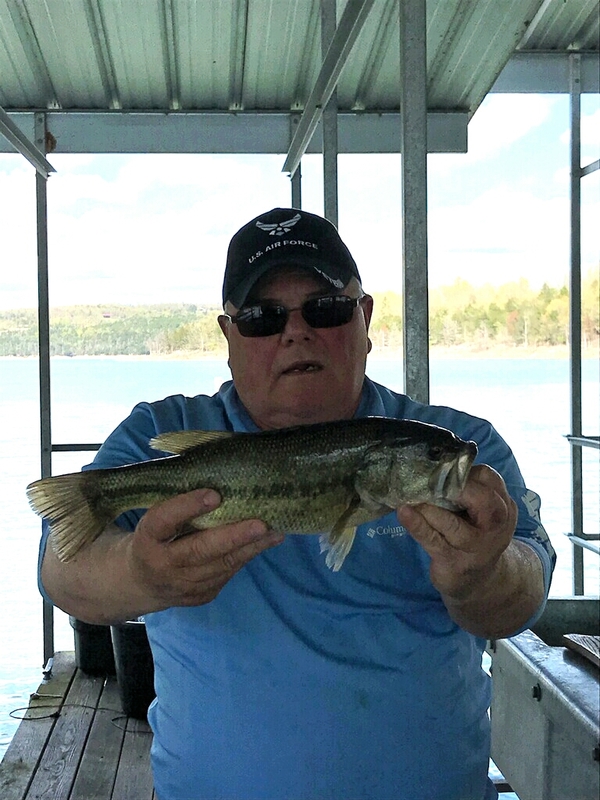 It appears that over the last couple of days, largemouth and spotted bass fishing has gotten really good. Baitfish have moved into the sunken buck brush and the bass have followed suit. Plastics and hard baits are both working. Unweighted flukes or bass assassins cast into the brush with slight twitches have made the bass go crazy. They are right inside of the brush so once you get hammered you will have a fun time getting the fish out. 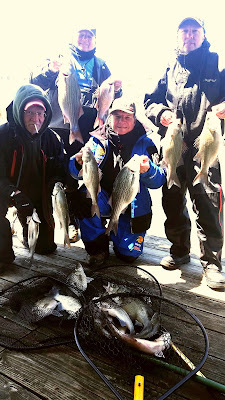 Lots of 14 - 17 inch fish have been caught and released with lots of smiles on the fisherman's face. Try out a jerk bait doing the similar routine. Find an opening in the brush and cast in a Zara spook and walk the dog out of the brush and watch the bass erupt on your bait. It will not be long until the smallies start to get real active. 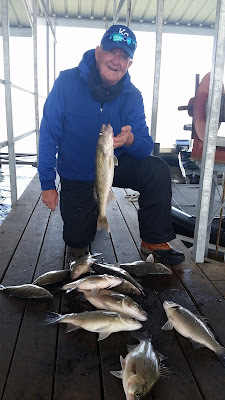 Walleye fishing has also been good. They are inside of the brush, same as the bass, or right at the outside edge of the brush. A 5 inch swim bait has been working well with a 1/4 - 3/8 ounce jig head. Cast the swim bait to the edge of the brush and let it sink a little, then retrieve the bait slowly back to the boat. Early morning and right before sunset are two great times to catch walleye close to shore. Casting out a suspending jerk bait at sunset to a little after dark will also produce some nice fish. 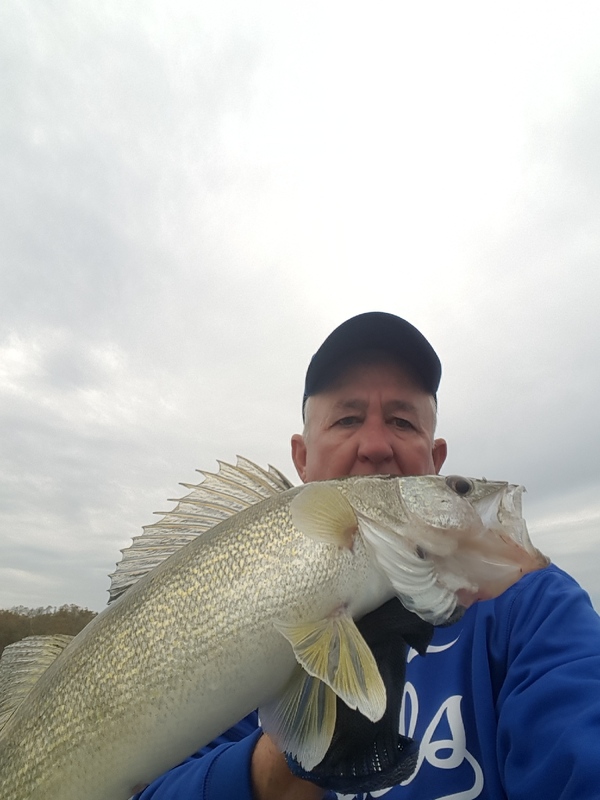 Make sure when you are retrieving the jerk bait you do it slowly with barely making a wiggle with bait. Striped bass, hybrid bass and white bass fishing has had its ups and downs over the last week. 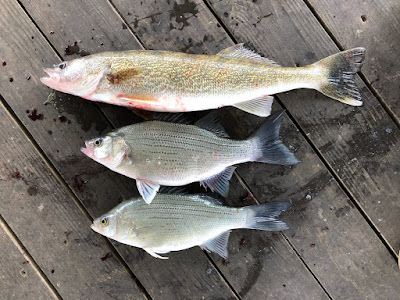 The fish are chasing the shad and the shad are continuing to move. One day you find them in the backs of coves in 15 - 20 feet of water and the next day they are on main lake points or large flats in 20 - 35 feet of water. Vertical jigging or casting out a spoon has been the best method of catching many fish. The hardest part is finding their current feeding location. I have a 4 mile stretch that my guests have been fishing over the last week with some great results and other times a very tough time. They have typically been found on the shallow side of the cove or lake not the bluff line side. Casting out a 5 inch swim bait has also been picking up some nice stripers. 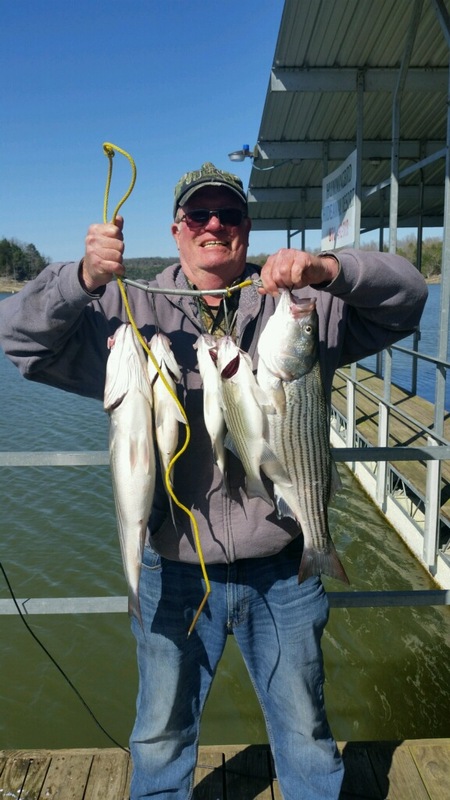 There are a few stripers that are feeding in close to the sunken buck brush. 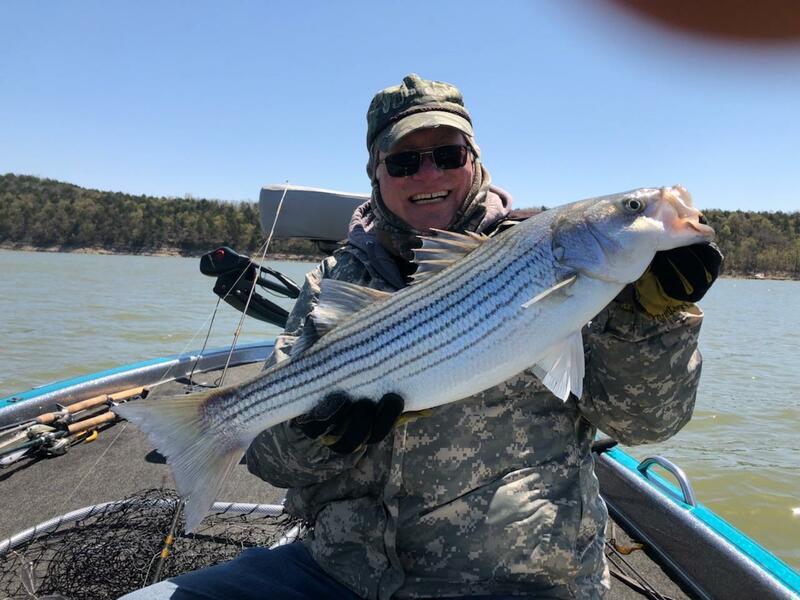 If things happen as prior years, we will soon see schools of stripers up close to the brush feeding early and late in the day. This is what I am hoping will happen, the sooner the better. The lake is currently on the rise after a slight rain a few days ago. We are currently sitting at 561.70 ft. above sea level with sporadic power generation though out the day. The surface water temperature is around 58 degrees on the main lake and close to 60 degrees back in the creeks and coves. The main lake is clearing nicely, but still slightly stained. You can see your bait at least 8 - 10 feet down. Some of the creeks and coves are stained, but are clearing.